Our first beer the Eggnog stout is alive! In this post we’ll run through our process for creating it and our plans from here. Here are the main ingredients and high level process. On 19 July 2014 The Black Hops Brewing team Ed, Govs and Dan got together for their first trial brew. The plan was to do a small batch at Govsie’s house in this idillic Mt Tamborine setting. He’d collected a decent setup to get a few test batches out of the way at home. From bits and pieces (mainly from Keg King), he built a 3 vessel H.E.R.M.S. system. Sure, it’s not the sexiest setup, but with the right technique and know-how, it’s more than capable of producing some fantastic brews. Govs got the yeast starter going on his little computer fan setup. Then we came across a slight problem. We had no water in the house! Yep, mountain problems hey? I don’t know a lot about beer, but I had a feeling that would be an issue. The brewmaster agreed, so we called in a favour from a nearby brewery. A few minutes later, we were setup ready to go. Here are a few pics from the day. In addition to the normal ingredients you might expect in a stout, we had a few more tricks up our sleeve. Namely a bunch of spices and brandy that we added in towards the end of the boil. We were then ready to knock it out and pitch the yeast. For this brew we wanted to bottle all of it and get it out to some people in the craft beer industry. We headed up on 9 August to bottle it and also to brew our next beer (more on that one in the next post). Here’s how it looked afterwards. Here is the detail in case you missed our post on how we did the beer labels. 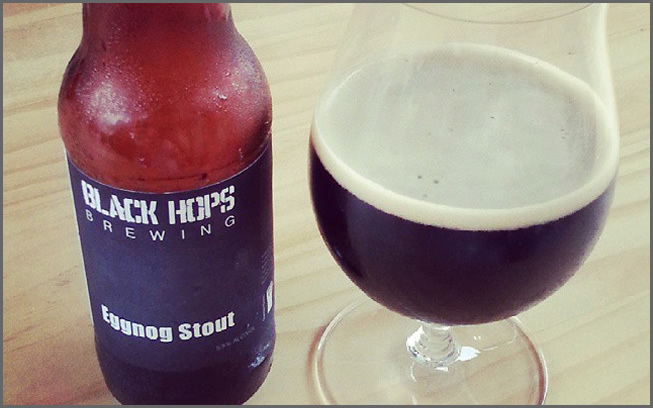 On Saturday 23 August, 2 weeks after bottling, our patience was rewarded with our first taste. We’d tasted it every step of the way so were had a good idea of what it would be like. Still, after popping the lid on a few bottles we were blown away when we could finally enjoy the finished product. With a silky smooth, velvet mouthfeel there is creamy milk, chocolate, vanilla, and some subtle nutmeg brandy and cinnamon, particularly as it warms. Everything we’d hoped for and more. This is a seriously delicious beer. We bottled 30 or so in total and we are giving away most of them to our craft beer friends and colleagues. If you are lucky enough to get one we’d love you to tag us on Instagram, Facebook or Twitter and let us know what you think. We’ve had a lot of interest from bars for a larger batch, so we’ll be working towards that. If you are interested in stocking it, please jump on our email list below and we will notify the list first when we have firm dates.